All about eggs: The German cuisine is using eggs in many or their recipes such as in cakes, desserts and creams but also sauces such as Sauce Hollandaise. Without eggs something would be missing indeed. We use egg yolks only in certain recipes, in other recipes you would use the firm egg white only and sometimes all together. Eggs are the best helpers in the German cuisine. Beyond that eggs are for sure better than their reputation when it comes to the cholesterol. The latest studies show that cholesterol has less bad effects on the cholesterol content in the human body. There is only the exception when the bodies have the problem to regulate it themselves. So eggs are more healthy then you thought. They carry important vitamins such as A, E and K plus several Vitamin B ones; they contain important minerals and trace minerals such as phosphor, calcium and iron. Nevertheless you would not want too many eggs as the amount of fat is quite high. The color is either white or brown. For German recipes you would use a small size that is the equivalent to a German egg size. Highest quality is the USDA stamp and it means Grade AA. Next level would be Grade A then followed by B (the latter you get in the most restaurants and bakeries because it is the cheapest egg). Farm raised, cage free and free range means that the hens are raised not in a factory. Organic eggs contain no chemicals, hormones or antibiotics used. Omega 3 eggs are enriched with flax seeds. 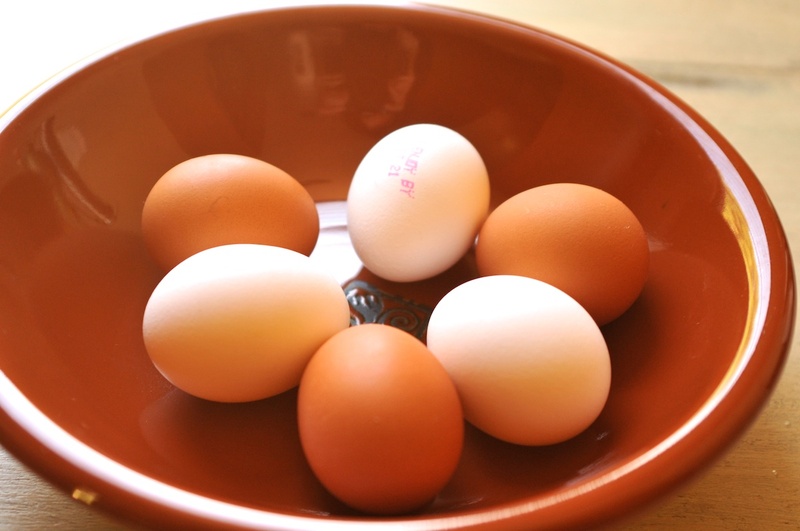 Vegetarian eggs are having more vitamins and nutrients added. The sell date should be on the package ans certain eggs contain a stamp on the egg that will tell you when they had been packaged. Now the labels on the packages don't necessarily mean that it is true. When it says "Free range" this can mean that the hens can go out for 5 minutes only. If you want to make sure that you get the best eggs you should buy them from your local farmer. See below more on what criteria you should look for when buying eggs.